Goblin Valley State Park in Emery County. The popcorn-like texture (gilgai) indicates soil that shrinks and expands with drying and wetting cycles. Mechanical and microbiotic crusts form a thin but hard veneer on the top of this expansive soil. The darker areas on the left are due to the presence of microbiotic crusts. “I don’t have a photograph, but you can have my footprints. They’re upstairs in my socks.” Groucho Marx (1935). So, where are your footprints? When not left in your socks, your footprints (or more likely boot prints) may be on a crusty soil. What are these crusts, what purposes do they serve, and how do footprints and other disturbances affect them? Two types of crusts are common on Utah soils, mechanical and microbiotic. Mechanical crusts develop on clay-rich soil. These crusts are formed by a thin upper coating of clay particles oriented parallel to the surface. 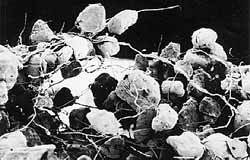 In contrast, microbiotic crusts are produced by living organisms and their by-products that bind together soil particles at, or very near, the ground surface. Many names (cryptogamic, cryptobiotic, microphytic, biological) have been applied to a variety of these organic crusts that are found throughout the world’s deserts and semiarid grasslands, shrublands, and woodlands. The existence and type of microbiotic crust depend upon variables such as soil texture, conductivity, pH (acidity), and moisture. The general appearance of microbiotic crust varies widely, depending upon the relative abundance of different crustforming organisms. Across southeastern Utah and surrounding states on the Colorado Plateau, cyanobacteria are the most abundant crust-forming organisms. Cyanobacteria are a group of microscopic organisms that harvest the sun’s energy through photosynthesis. The cyanobacteria are not alone, as they are commonly found with green algae (another group of photosynthetic organisms). Mosses and lichen can also grow on crusts already stabilized by cyanobacteria and green algae. Both microbiotic and mechanical crusts stabilize soil and affect infiltration of rainwater, seed germination, and plant growth. With microbiotic crust, filamentous sheaths hold soil particles in place and directly improve resistance to wind and water erosion. that decreases rainwater infiltration, further increasing runoff and downstream erosion. Both microbiotic and mechanical crusts can be impacted by foot or vehicle traffic or any other human or natural disturbance. For example, a single footprint can damage mechanical crust and the filaments that create microbiotic crusts. Repeated foot traffic can completely remove this protective layer. Once damaged, the erosive powers of wind can easily blow soil particles away. 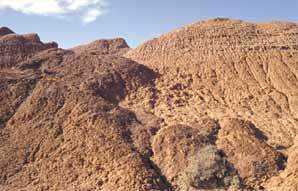 The loss of microbiotic crusts increases susceptibility to the erosive power of water as well. Fortunately, damage done to crusts is reversible, though it can take a long time. The recovery time for mechanical versus microbiotic crust varies greatly. Mechanical crusts begin to reform substantially with the first intense rainstorm; microbiotic crusts take much longer. Cyanobacteria and green algae secrete soil-binding sheaths only when wet, needing repeated wet periods to reconstruct their crust-forming network of filaments. Microbiotic crusts can begin to substantially recover in as little as 1-5 years, or may take more than 50 years, depending upon crust type, soil type, climate, and extent of initial disturbance. For more information on microbiotic crusts, see Roxanna Johnston’s Introduction to Microbiotic Crusts, published in 1988 by the U.S. Department of Agriculture. For more information on footprints, see your socks.